A million thanks for your prompt reply. Your items had been packed and ready to be ssend out to post office tomorrrow. Hope you like the items that I had sent you. I am still waiting for email from one of the mystery goodie bag winner- Joyce. Will Joyce please kindly email me asasp? The prize will be put on hold for a week. After which a new winner will be reselected. A million thanks to everyone for taking part in my giveaway. It had officially closed on 15th Jan 2012 at 23:59 and its now time for me to announce the result. Congrats, Grace! You are the one super lucky winner! Please email me your name and mailing address at ireneyksoh@yahoo.com.sg, with the heading: Ireneyksoh CNY Smartpac Mystery Goodie Giveaway. Do please email me soon so that I can send out your prize within the shortest possible time and hopefully it reaches you before CNY. Congratulation to the above winner for the mystery goodie bag. Do please also email me your name and mailing address at ireneyksoh@yahoo.com.sg, with the heading: Ireneyksoh CNY Smartpac Mystery Goodie Giveaway. Do please email me soon so that I can send out your prize within the shortest possible time and hopefully it reaches you before CNY. Was kinda upset that I didn’t manage to be there during BonJapan’s Grand opening 30th July 2011. Even more sad when I saw pictures of the mystery bag winners with prizes that I would so much loved to own too. So when they announced online that they will be having a second opening celebration, no words can truly describe my happiness. With such vast selections available, I’m kinda spoilt for choice and could not really makeup my mind which to buy. Took me quite some time before I finally decided to get the above. Will definitely be back for more once I finished them all up. Didn’t win anything big from the mystery bag despite 2 tries. Well, I never ever had the luck to win anything good anyway. Sob! Sob! I can’t make up my mind what prize to offer in this upcoming giveaway. As such, I’ve decided to put in a bit of things here and there and create a mystery goodie bag out of it. 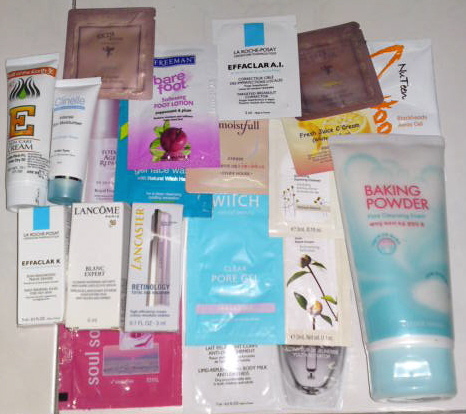 Items in the bag range from skincare to cosmetic products, randomly selected. I’m gonna to start with one mystery bag and shall proceed to add one more with every 10 additional participants. By doing so, the chances of winning one would be higher. Everyone is precious to me. And I really wanna make more people happy. Till then, thanks for dropping by. There will be a total of 40 bags up for sale, on while stocks last basis. And to make things more excited, 2 out of these bags contains an extra bottle of Cure Natural Aqua Gel. So the more bags you buy, the higher chance of getting that bonus bag. Anyone interested, please drop me a comment here, along with your email address and I will get back to you as soon as I could.